Okay, so we’ve been over the basics of this bizarre Rand Paul story, but let’s skim through it once more, because there are more weird updates and I am about to hitch a ride down to Bowling Green my goddamn self to investigate why a U.S. Senator is being so coy about getting physically attacked by his neighbor of 17 years. 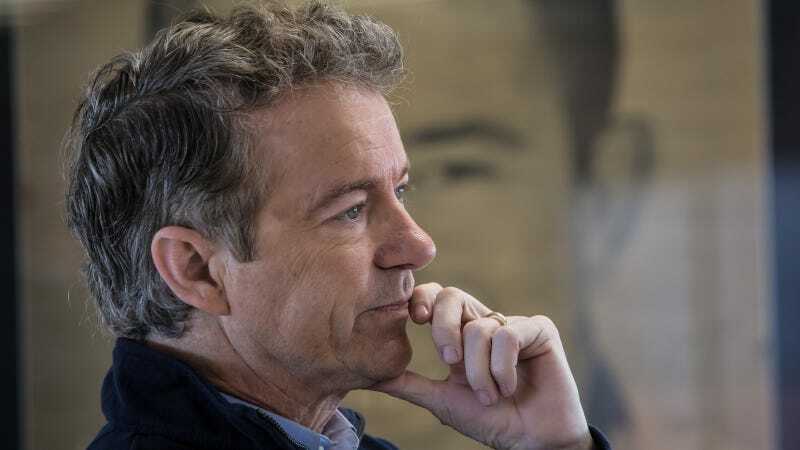 Sen. Paul was recently violently tackled by his neighbor Rene Boucher, an anesthesiologist with whom he reportedly had a number of “landscaping” disputes, although others say they haven’t spoken in years. At one point in the past, the New York Times reported, the two men worked in the same hospital. Paul was reportedly dismounting a lawn mower at the time and wearing earplugs, so he apparently didn’t see Boucher coming; he has six broken ribs and a pleural effusion, which means a buildup of fluid around the lungs. His staffers initially seemed to downplay the incident, saying the Senator was “fine,” which it seems like he is kind of not. Three Kentucky Republicans, speaking anonymously, told the Times that Paul was “embarrassed” by the attack. Any significant absence in the Senate would be a setback for the GOP’s tax agenda, but Mitch McConnell recently announced that Paul is expected back next week. His neighbor’s lawyer referred to the reason for the attack as “trivial” but did not clarify further, only asserting that it had nothing to do with politics (Boucher is a Democrat, and the Washington Examiner reported that he’s published a number of anti-Trump posts on social media). Don’t zone out because this gets crazier. Paul himself, Politico notes, has tweeted stories from Breitbart and the Washington Examiner that question “fake news” reports that the fight was over landscaping, quoting multiple members of the community who asserted that Paul was a good neighbor and that the two men hadn’t spoken in years. The Washington Examiner in particular focused on Boucher’s anti-Trump politics, a line of inquiry that Paul apparently endorses. AND NOW, although a lawyer for Boucher did not deny the attack and called it “a very regrettable dispute between two neighbors over a matter that most people would regard as trivial,” Boucher has pleaded not guilty to assaulting Paul. If you are in possession of any intel, please email me at once.